Are You Looking for Trophy Alternatives? This entry was posted on September 26, 2017 by Jessica Anderson. The kids on your sports team have been working hard all season and deserve some recognition! If you’re looking for a way to say ‘great job’ without awarding a participation trophy, you’re not alone. Looking for something other than trophies for your team this season? If your kids are older and have already covered their room with trophies, you may be looking for something new and different. Here are some top ideas of alternatives to trophies for your team, such as the Strideline Socks featured below! Let us know how we can help - give us a call at 877-926-4700. Everyone on your team will love Strideline Socks! Contact us for details. Bag Tags - Full color bag tags are great for travel or for gear bags. Drink Tumblers: Engrave a sport ball image (like soccer) with the player's name and these tumblers will be used all year long! Trading Coins & Pins: Unique to your event, create lapel pins or coins give to participants or to trade with other teams. 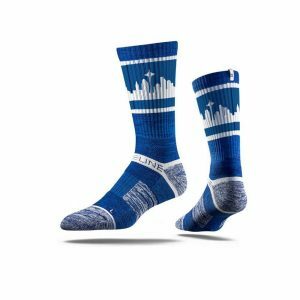 Logowear: T-shirts, socks and other logo wear are cool gear to show off your team! Gear Bags - Everyone needs a place to shove their stuff; a useful way to keep track of player's equipment. Acrylic Display Cubes: With options for football, soccer and volleyball, display a game ball with pride. Makes a great coach's gift! Ball Stands: For footballs, soccer balls, and volleyballs, these solid walnut stands include a small engraved plate. Medals or Dog Tags: Kids can wear them or use as a zipper pull for gear bags and backpacks. See football, soccer, and volleyball options. Photo Collages - Remember the season with a photo each player can frame. Even if you aren't awarding trophies to your team, make sure to put some meaning behind your gift. Don’t just hand them out without praise. When presenting a small token of the season, make sure to talk about each player's dedication, hard work and never quit attitude. Be sure to mention something different yet specific for each player. On my daughter’s soccer team, the coach will start by saying, “This player was a real hard worker. She came to every practice and game ready to give it her all. Her defensive moves …” By this time the whole team is guessing who it is and screaming the girl's name. This way she’s being recognized by the coach AND her teammates at the same time. Visit my post Making Sports Trophies Meaningful for even more tips. Whether you’re getting trophies, medals or some alternative recognition, enjoy the end of your season! Editor's Note: This post was originally published on November 6, 2012. It has been updated for content.